To me, "Count your blessings" is not just another proverb. And occasionally, I do experience such blessings -- for instance when I find really special things that cost very little. To give you an example: ten years ago I found the first notebook computer ever made, and it cost next to nothing. For some time I used it for schoolwork. You can read a weblog about it. 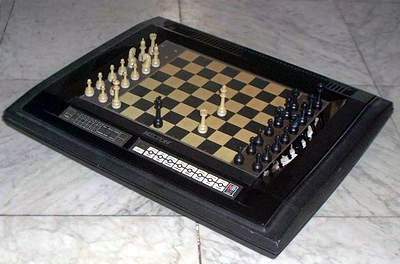 Another example: one day I was at a computer market, when I saw one of the most extraordinary chess computers ever made, the Milton, a machine that could move its own pieces. The price was 75 guilders, which is about what you pay for the cheapest chess computer on the market. It was so cheap because the adapter and manual were missing. I found substitutes before the week was over. A few weeks ago I visited a bookshop, where I found The Oxford Book of Humorous Prose by Frank Muir. Frank Muir was probably the funniest man I had ever seen or heard. As a student, I often listened to BBC World Service. One of my favourite programs was a quiz called My Word. I think Frank Muir was the soul of the program. He died in 1998 -- about which I never read a word in my (Dutch) newspaper. At the bookshop, I was prepared to pay the full price of the book, which was thirty euros or so. But the price tag said 3.50 euros because its cover was slightly damaged. The book is really a treasure house. I find it hard to resist the temptation to quote. The reader knows more about comedy than I do. That is to say, every reader knows precisely what he, or she, finds funny, which is more than any author can know about the reader. This is typical of Frank Muir: an observation from an angle that nobody else would think of. Living in an age of rudeness, it's hard to imagine Frank Muir saying anything rude. After all, isn't rudeness an expression of spiritual poverty - which was as alien to Frank as moderation is to a pig. George Meredith's theory that comedy and laughter belong to the intellect and not to the emotions has a lot going for it but there is not much intellectual involvement in a baby's gurgling laugh when somebody bends over its cot wearing a funny hat. The jokes of most social and professional comedians ventilate our sexual anxieties and confirm our racial and other prejudices (Hazzlitt wrote, 'for every joke there is a sufferer'). On the Internet, you can find the Frank Muir Tribute Page. It was with some melancholy that I found this description for his uniqueness: 'They threw away the mould'. Yes, I'm afraid it will be a very long time before the world will again see such a rare combination of charm and wit.